We know you see all this text before you and your busy eyes glaze over, but this is no ordinary newsletter, conservation friends. This is remarkable stuff. 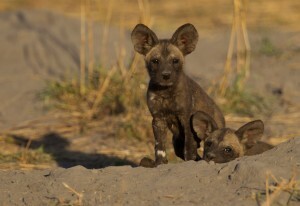 Each year we anticipate one of the most exciting seasons, when our resident wild dog pack, The Selinda pack, dens. This normally occurs in June – July and the result has been as many as 15 puppies from just the one alpha female. However, this year we were absolutely in awe at what transpired. Not only is it remarkable on a local scale, but perhaps unheard of continent-wide among wild dog enthusiasts and researchers alike. Selinda Reserve is now home to three resident packs and not only that but the denning calendar and alpha female dynamics are in disarray and hunting has taken on new proportions. Read on for the full details, something to sing from the rooftops about, this is not common! It all began with unique circumstances whereby existing regional packs from neighboring Kwando and Savuti concessions encountered the Selinda pack. Ferocious fights were witnessed in November and December of 2012, spectators weren’t sure if alpha females had been killed. The end results of these battles are being seen today as packs fractured and relocated. The result is now three packs in total: The Selinda, Mopane and Makoba (or Nare) packs. The Selinda pack became a bit smaller as members left to combined with the members of the previous Kwando pack (to the north) to make the now Makoba pack, and then we discovered the Mopane pack when we opened Selinda Explorers Camp in 2012. This is crucial strategy in fact, because it prevents inbreeding; however, it also upsets the packs’ natural balance because you have new alpha females vying for position against already established alpha females. This was particularly the case in the Selinda and now Makoba packs. We all waited with anticipation. 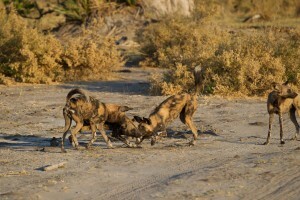 In Botswana wild dog dynamics, the alpha female of each pack will generally mate with the alpha male of each pack, then find a den in around May, the puppies will emerge a month later. During the denning the cooperative, and close-knit pack continue hunting, providing for the alpha female and the puppies in the den. They tend to hunt smaller antelope species such as impala or the young of kudu, tsessbe, wildebeest and zebra. The alpha female holds the pack together who are organized very much on a subordinate structure of togetherness. You will not see dogs fight on a kill like Lions so often do. Three years ago, guides witnessed pack members hunting and returning to the den site to not only regurgitate for the puppies, but also for an older male who was no longer able to hunt himself. It is very difficult to remove yourself from any empathy towards animals with this kind of nurturing behavior! Initially, in the case of the Selinda and Makoba packs we had concerns, as there were no signs of denning at all. By July, we began to assume that there would only be a litter from the Mopane pack. Oh, but how wrong we were. And you might think it’s a simple story from here, but wrong again. First let’s take you along for the ride. Sitting with our cameras on our laps, ready for action, shutter speed on high, looking for one of the five wild dogs who only moments earlier had been seen chasing impala in all directions throughout the northern part of the Selinda Reserve. 17:45 exactly and the pack were off on its evening hunt – there were mouths to feed – puppies back at the den. Dicks, our guide for the week, stopped the game drive vehicle on some higher ground for a better vantage. We scanned the bush for any signs of the hunt that was unfurling at an incredible pace. Before we could settle down an impala burst past from left to right, one metre from the bonnet; two seconds later a flash of white and orange, the wild dogs were on the chase, three seconds more and they were gone. Not one image was taken by our SLR cameras, too fast, not even the best autofocus would have managed! A cloud of dust, and scattered track, the only trace that anything had taken please here! The alpha female originally came from the northern Kwando pack, then the split in the Selinda pack resulted in her taking position as the alpha, and the spin-off members start the Makoba (Nare) pack. The Mopane pack, named after the area they prefer, an area dense with Mopane forest. This area is on of the most densely populated areas of the Selinda Reserve, and possibly all of Botswana. It is reputes to have the highest number of elephant bulls as well as the largest buffalo herds in the country. Diverse antelope species such as roan, sable and eland walk its paths too. The Mopane pack were the first to den, back in April. The pack’s pregnant female had been seen hunting near Selinda Explorers Camp towards the eastern end of the Selinda Spillway. From her behavior, we knew a den was nearby. The anticipation was palpable. Around that time, guide Kane Motswana had seen the three adults chasing a young kudu right through camp and into the Spillway at 6:00am – quite the wake-up call. The Spillway water slowed down the kudu, enabling the pack to secure the upper hand and catch the prey while the guests looked on in awe. Later that day, not far from our Selinda Canoe Trail’s campsite, the den was found. The adults already regurgitating the recently caught meal for the puppies. The den, placed discreetly n a termite mound can only bee seen on foot, and is seen only by guests on the Selinda Canoe Trail. We practiced low impact viewing by foot, and the puppies were relaxed with the spectators, who kept a safe distance so as to not attract predators. After about 6 weeks the puppies, the puppies began leave the den and follow the pack. Dogs in general do not like to den for too long for fear of discovery by vicious interlopers. Hyena, lion and leopard all pose a considerable threat to young. 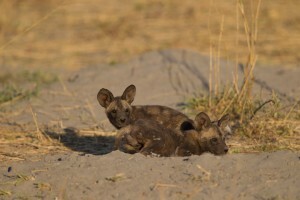 We joke that this must be the only “canoe access only “ wild dog den in Africa. Let’s hope they will be there again next year. At the time of going to print, all these puppies were doing well, fit, healthy and strong. For the last five years, the Selinda pack has chosen a spot just a stone’s throw from Dereck & Beverly’s famous Joubert Island for its den. This year is no exception. Unlike the Mopane pack, where the den is in a termite mound, this one is in old aardvark burrow. Remoteness and camouflage are imperative for successful denning; and they’ve taken no risks here with the den in some thick turpentine grass in an otherwise open flood plain. One could easily walk past and miss it, how our guides found it is remarkable. Once discovered, we implement strict procedures – the sight is immediately shut down, with absolutely no visits, until the puppies emerge from the den for at least 2 weeks. After that time, we allow one vehicle at a time to visit. 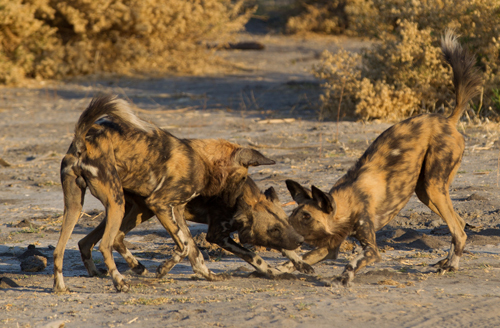 For 2013, we were anticipating a similar denning pattern to the previous four years; however we never took into account how the conflict among all the regional wild dog packs might result in something truly rare. Not only has the alpha female had a litter, but a subordinate female has also. Whilst this is unusual and not common, it is not unheard of. This is because the subordinates are intended to service the puppies of the alpha female in order to maintain a dominant strong gene pool and also reduce pressure on the pack. With two litters, the subordinate’s puppies will only survive if the alpha female accepts them as her own; otherwise, she will kill them. At the time of print, the subordinate’s puppies are still in the den so we are unsure of the outcome here. The reason for the wild dogs having smaller litter sizes this year is believed to be down to the fact that newer alpha females generally only have 5-6 puppies, with their litter sizes growing as they become older. With the rainy season just round the corner, the grasses will turn green and grow quickly, limiting the areas that the dogs can hunt. In the past three years the Selinda pack have been found hunting in and around Zarafa Camp for the best part of December to March because a large pan near the camp provides the dogs with an excellent open area, clear of grass, for hunting. And the pan is abundant with impala so this becomes an outstanding location to see the animals hunt regularly. Makoba, a pack just ten kilometers north of Selinda camp, is an area known knobthorn (Makoba) trees. The open area is ideal for dogs, and this pack has reared six puppies that just emerged from the den. The den is ideal for photography, open and clear of grass; however, this is also cause for concern because the alpha female chose a very vulnerable site, visible by predators. Despite this, all six have survived probably in large part to the absence of heavy hyena and lion presence of late. Even this pack has its own claim to fame. Just recently, guide Dicks announced that he wanted to change their name to the Nare (“Buffalo”) pack. His suggestion was due to the pack’s very unusual hunting characteristics by attempting to hunt young buffalo; an extremely dangerous habit even for much larger predators such as the lions of Duba Plains. The wild dogs favoured prey is the impala, an abundant regional antelope leading to great success among dogs in the Selinda-Linyanti-Kwando corridor. In general, an adult buffalo is far too large for dogs but Dicks and our guests have witnessed three occasions when the pack took down a still sizeable young buffalo with the herd at its defense attempting to trample the pack. Interestingly, records show that the Kwando pack to the north, from where the “Nare” pack males hail, has also been seen hunting buffalo in previous years. It would seem they have brought their old skills with them to Selinda. 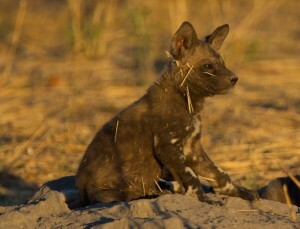 Wild dogs are the rarest mammal in east or southern Africa. Numbers of between only 2,500 to 3,500 scatter themselves throughout their last remaining habitats. The dogs need unadulterated space in order to hunt. They have the highest success rate of any mammal predator at around 85%. Their tactic is persistence by running Impala, their favoured prey, through open spaces at great speed. Hot on the heels of the antelope, the prey tires, and the wild dog speeds up for the final kill. Speed and strategy is the dogs’ greatest asset in hunting. Once downed, the pack finishes a kill in minutes, in a frenzy of feasting, in order to avoid attraction by lion and hyena. The plight of the African wild dog, which has led them to becoming an IUCN endangered species, is testament to both their persecution but also their resilience. Canine distemper has badly affected the species despite being no relation to the domestic dog; it can get this deadly disease from contact with the domestic dog. Due to wild dogs massive home ranges, the dogs will often run into farmland areas to be snared or shot. If an alpha female is shot, this can spell the end for an entire pack. 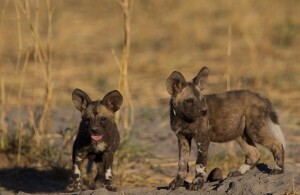 And then habitat: wild dogs need impala and lots of them, especially when there are puppies to feed. With wildlife areas becoming more and more fragmented due to pressure from humans, there is less space and less food. 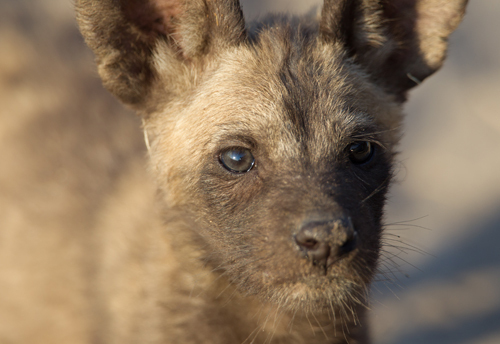 Therefore, it even more outstanding that wild dog numbers in the Selinda have doubled this year from last; and with 25 puppies on-the-go we have hopes for an overall increasing population. Much more by Alex Walters and many more on the fascinating African e-zine, Great Plains Conservation BushBuzz – Dispatches from the Field.